…brought to you by the letter, ‘E’. 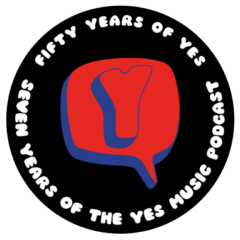 The fifty-sixth episode of the Yes Music Podcast featuring the letter, ‘E’. Listen and see if all your letter ‘E’ choices are included. Then let me know by contacting me via any of the different routes on the right hand side or by leaving a comment below! How many Yes tracks begin with ‘E’? Have I missed any important facts, tracks or Yes concepts? The Letter E….I enjoyed that. Just for the sake of completeness, the Bonus Tracks on “Going For The One” include a track called “Eastern Numbers” – which is an early version of Awaken. That brings me to an interesting point you made about how the cover versions Yes did in the early days “seem to have more freedom in the arrangements when they were working with other peoples material” “they seem to have found it easier to have worked from an existing piece of music”. I wonder whether it may be a freedom from the presence of the composer. As you probably know, it is well documented that in the Beatles the lead composer of a song was the final arbiter of its arrangement and decisions on instrumentation and backing vocals etc.. (at least this was their method after their first couple of albums when they were more in control in the studio). I suspect that this is true in a lot of bands and it may be that on cover versions like these two we see everyone contributing equally because of a LACK of composer in the studio. There may also be a clue in the title of the Tormato extra “Everybody’s Song” you analyse which is credited to Anderson/Howe/Squire/White on Tormato and later to Downes/Horn/Howe/Squire/White when it became “Does It Really Happen” on the Drama album. I think as a track in both versions it sounds very much like a band composition rather than something composed by one or two members and played by the band. Hello Paul. Glad you enjoyed the trip through the letter, ‘E’. Eastern Numbers – no I haven’t heard that. Will search it out. Thanks for the addition. Thanks also for the thoughts about the composition/re-arrangement with/without the composer. It would also be interesting to take a look at what happened when Queen decided to credit songs to the band, for example on ‘Innuendo’. I know this was mainly for royalties but I wonder if it also had an effect on the writing and feeling of ownership. From my own small experience of writing music, I know that ownership is a very big deal. I would hate anyone editing or otherwise messing about with my creative output. Yes, I think you are correct and I keep forgetting that fact! I have seen YouTube videos which prove this – how I wish I had been able to be there in person like you! Kevin, just discovered the podcast and I’m really enjoying it. I sure wish you could play 30 seconds of each track you mention – being a Yes newbie I’ve not heard of most of them and I listen in the car so I can’t get on-line to check them out. Thanks Rob. I dearly wish I could include music. However, in the UK we have no ‘fair use’ law. I know some people just get on with it but I’m too scared!! I am planning some proper music-based content though – please watch this space! !